On Sunday Patently Apple posted a report titled “Tesla’s Infotainment Tablet may be Large but nothing compared to what the Industry Envisions for the Future.” One of Samsung’s patents that surfaced last week illustrated a next-gen vehicle dashboard that contained a full width display that could be customized by the driver. The dashboard could show maps with in front of the driving wheel or the full width of the dash. The dash could run apps like music and others as we presented in ourPatently Mobile report. Foxconn’s Terry Gou stated that one of the products they’ll be making in their U.S. plant is displays for the auto industry and with Apple developing some kind of vehicle and/or intelligent OS for next-gen vehicles there could be a connection down the road. Today we learn that Mini LED displays may be use for these next-gen dashboard displays. 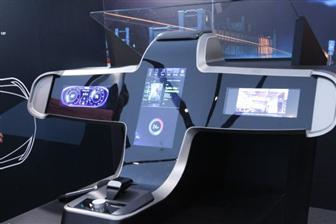 The photo of a modern dashboard made up of a large display is presented in a new Digitimes report today which supports the Samsung patent and future trends for vehicle dashboards that we covered in our weekend report. Back in May we reported that Foxconn-Sharp wasacquiring a U.S. Micro-LED display start-up. They may be able to tap into the plant’s know-how to use Mini LEDs for the auto industry. According to the Digitimes report, Mini LEDs, with much higher yield rates than those for Micro LEDs, are expected to come into commercial production next year, with initial application expected to be backlighting of LCD automotive displays, according to Digitimes Research. Mini LEDs range from 100-200 microns in size, larger than sub-30-micron Micro LEDs. The former’s much larger size makes them less difficult in mass transfer and mass inspection, offering higher yield rates, Digitimes Research indicated. As compared with conventional LEDs used in direct-type backlighting,Mini LEDs offer better display quality, more flexibility for device design and curved-surface screens, less power consumption and visibility under strong sunlight. For direct-type backlighting of automotive displays, a single panel will use several thousand to over 10,000 Mini LED chips and there will be monthly global demand for an estimated 15.56 billion Mini LED chips in the first year of commercial use. Whether Apple’s LuxVue could begin with Mini-LED displays for next-gen Apple Watches or other devices is unknown at this time.